Thursday: Sun and clouds, chance shower. Highs in the 70s. Overnight Thursday: Crisp and mostly clear. Lows in the 50s. Friday: Fair and pleasant. Highs in the 70s. 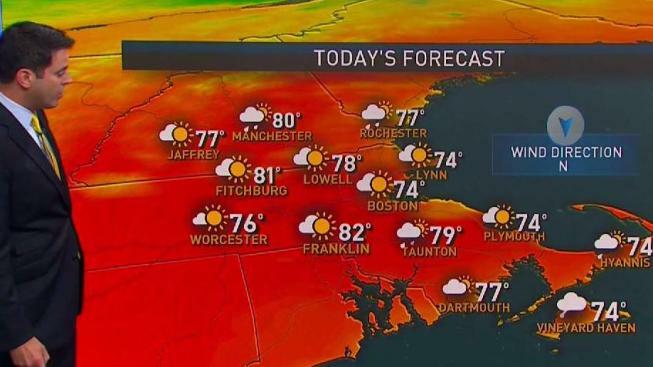 A wave of low pressure south of New England brought some rain to parts of Connecticut, Rhode Island, and southeastern Massachusetts overnight. Anyplace starting off damp should dry out quickly as a front pushes east and offshore. High pressure from Canada is going to move in during the day, with temperatures a little cooler: high in the 60s to low 70s north, 70s to low 80s south, but cooler at the shore. Sunshine should win out for the day, but there are a few instability showers left over along and south of the Massachusetts Turnpike. Mild, to cool and dry overnight with low temperature in the 40s north 50s south Thursday night. Sunshine fades behind high clouds, high temperature in the 70s Friday. The next warm front enters the region Saturday with plenty of clouds, and occasional rain possible. Highs in the 60s at the shore to lower 70s inland. Fog and drizzle may arrive at the south coast during Thursday afternoon. It will turn more humid on Saturday evening with scattered showers and temperatures will hold in the 60s Saturday night. We get into the warm sector on Sunday with a few breaks of sunshine, and also a few showers and a thunderstorm with a high temperature closer to 80°. Then, another cold front comes through on Sunday night with clouds and showers to start on Monday, followed by slow clearing in a high in the 70s early next week.